Princeton University Press, 9780691177359, 240pp. How the billionaire owners of Hobby Lobby are spending hundreds of millions of dollars to make America a "Bible nation"
Like many evangelical Christians, the Green family of Oklahoma City believes that America was founded on a "biblical worldview as a Christian nation." But the Greens are far from typical evangelicals in other ways. The billionaire owners of Hobby Lobby, a huge nationwide chain of craft stores, the Greens came to national attention in 2014 after successfully suing the federal government over their religious objections to provisions of the Affordable Care Act. What is less widely known is that the Greens are now America's biggest financial supporters of Christian causes--and they are spending hundreds of millions of dollars in an ambitious effort to increase the Bible's influence on American society. In Bible Nation, Candida Moss and Joel Baden provide the first in-depth investigative account of the Greens' sweeping Bible projects and the many questions they raise. Bible Nation tells the story of the Greens' rapid acquisition of an unparalleled collection of biblical antiquities; their creation of a closely controlled group of scholars to study and promote their collection; their efforts to place a Bible curriculum in public schools; and their construction of a $500 million Museum of the Bible near the National Mall in Washington, D.C. Bible Nation reveals how these seemingly disparate initiatives promote a very particular set of beliefs about the Bible--and raise serious ethical questions about the trade in biblical antiquities, the integrity of academic research, and more. 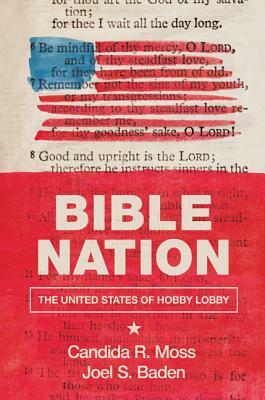 Bible Nation is an important and timely account of how a vast private fortune is being used to promote personal faith in the public sphere--and why it should matter to everyone. Candida R. Moss is the Edward Cadbury Professor of Theology at the University of Birmingham and the author of, among other books, The Myth of Persecution: How Early Christians Invented a Dangerous Legacy (HarperOne). Joel S. Baden is professor of Hebrew Bible at Yale Divinity School. His books include The Historical David: The Real Life of an Invented Hero (HarperOne).